Months ago I wrote my first commercial review. We hadn’t done a review on Uncharted 3: Drake’s Deception and G. Christopher Williams, my editor there, asked if anyone would do it. I wanted to try my hand at a commercial review with a score and everything rather than the critique I’ve been doing pretty much my whole ‘career’ as a video game critic. It was interesting to say the least. Trying to boil everything about the game down into a coherent argument that described and affirmed an opinion into not only into something solid, but something digestible. A review is for someone who hasn’t played the game and thankfully I had a parent on hand to read it over and point out anything he didn’t understand. Of course before that I had to figure out my issue with the game. Broadly it’s that it is inconsistent. Half of the game is padding and the other half is a stunning play experience that presents the vast scope of what an Action/Adventure game is capable of. When the game goes all Lawrence of Arabia on us or 1001 Arabian Nights or hell even Indiana Jones and the Last Crusade it really shines. Pity it’s all crammed into the back end. I know the score is the least important part, but I did say before that in some way the number is the thesis of the review that the writing must support. I debated with myself over the score much more than I should have. It was always between a 5 or a 6, but I kept waffling between them. Remember I believe in the full 10 scale and like words, numbers have meaning. 5 is dead middle of the road, 6 above average. Half of the game was good, half wasn’t. I figured that good stuff was better than the bad stuff was bad so I went with a 6. And according to Metacritic that is the second lowest score awarded to the game. Though AC Club didn’t so much give it a 5 as a C.
I bring this up, because I’M BACK ON POPMATTERS! Yes after a multi month collapse where I had no will to write I’ve been allowed to continue writing for PopMatters with a weekly column. I even have a section tag now. Keeping the TheGameCritique brand alive. In my return I’m looking at the Uncharted series as a whole and for the first one I look at how each suckers us in to the story each wants to tell. Here is where I think Uncharted 3 failed so much. The opening in London itself is great, but the implicit promise the opening provides is so thoroughly ignored for most of the rest of the game. I should back up a second. The implicit promise is a concept I got from a book that is on my shelf but have completely forgotten the title of so I don’t know which one it is. Essentially it is the product at the end of the process whereby the audience/reader/player goes from knowing nothing to having a expectations of what the work is going to be/do. Despite advertizements, reviews, blurbs etc. the audience at the very beginning is willing to accept anything and everything. Nothing is out of bounds or unacceptable. Unicorns could ride in on a rainbow rocket while a tax accountant reads the news paper while a flight attendant limbos towards him to hand him a cup of coffee and no one would complain because maybe that’s just the type of story this is. As things go on, things are solidified with regards to expectation: plot, characters, themes, style, tone. Those are the rules the work must play by and they are of its own creation. 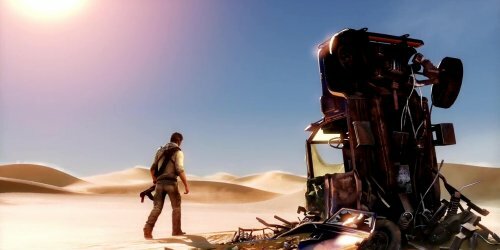 Both Uncharted: Drake’s Fortune and Uncharted 2: Among Thieves do well to follow their implicit promises, but Uncharted 3: Drake’s Deception drops the ball hard on that count. Note: In the piece I say that it is possible to establish a work’s implicit promise with a single sentence. I’d like to show a few that do just that. From this one line we know so much about the character, the world she lives in, what the plot of the book will be about and the themes it will cover. Regardless of how it ends while you’re reading it, Pride and Prejudice is all about this single sentence. The opening line of Nueromancer. It sets up the tone and the setting pretty well. It’s a play on the noir cliche “It was a dark and stormy night” by changing the metaphor to technology and tells us this is a world that would use this. I’ll stop with this one from George Orwell’s 1984. This line just throws the reader off kilter so much. Yes, clocks can strike 13 if they’re on military time (which actually fits), but it’s not common. We are entering a world where things aren’t right and it might be somewhat similar to our world, but not completely. We haven’t met a single person yet, but we know where the books is going.